I wanted to create a little guide to Lisbon after I wrote about the hotel we stayed in. There is so much to see in Lisbon it really is the perfect place to escape to for a city break. There are historical elements, as well as shopping and great food. So there really is something to suit everyone. Of course we didn’t get to try everything but I’ve popped a few little suggestions down below. Luzzo Pizzaria – R. de Santa Marta 37C, 1150-005 Lisboa. This happened to be just across the road from our hotel, so when we landed on Friday night we knew we’d be making a beeline for this place. The restaurant itself was packed with locals, so we were confident we had made the right choice. The pizzas here are incredible, ultra thin so you don’t have that uncomfortably full feeling you so often get with pizzas in the UK. They had lots of unusual toppings so you could try something a little out of your comfort zone. 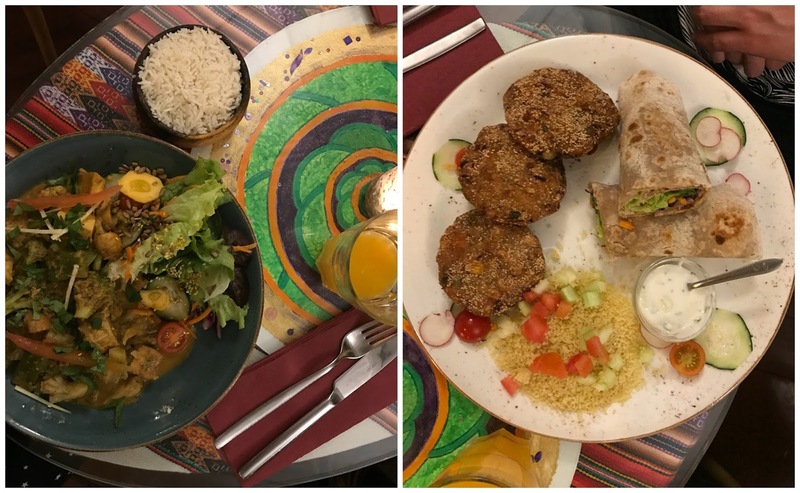 Restaurante Vegetariano Psi – Alameda Santo António dos Capuchos, 1150 Lisboa. I found this place on trip advisor – it had some great ratings so I thought I’d book a table. Both of us really enjoy vegetarian food (I don’t do red meat) and so I was looking forward to eating at a vegetarian only restaurant. I think most people have the perception that you want be full but this was not the case here. I had a really tasty tofu curry and Rory went for the veggie burgers. We were both impressed with the size of the portions and how adventurous the dishes were. Word of warning though, you can’t get an alcoholic drink here so don’t expect to find it on the menu. The LX Factory is somewhere lots of people told me to visit. Made up of old warehouse buildings, a little part of Lisbon has been transformed into an independents haven. With plenty of shops, restaurants and other independent shops to browse around you could spend a good couple of hours here wandering round. Make sure you go when the weathers good so you can walk around at your leisure. There is some awesome graffiti here too which makes it prime Instagram fodder. This avenue is all about the high end shops, so if you have some money to burn you’ll find Louis Vuitton, Gucci and more here. It’s a really long avenue that leads you down the the main shopping area in Lisbon, so its worth a stroll down. The weather wasn’t great on the Saturday morning so we thought we’d find something inside. The aquarium in Lisbon is the size of 4 olympic size swimming pools. There is so much to see here you can spend a couple of hours wandering around. The centre tank is memorising and we spent a lot of time just staring at the fishes! They do also have some rather cute penguins and otters. This is the perfect place for adults and children. Just down from the aquarium on the sea front you will find the cable cars. You get some great views from the top and you can see all of the ‘new’ part of Lisbon which was built for the 1998 Expo. This is the perfect place for the holiday selfie and it’s pretty cheap! We visited the castle on one of the worst days. The rain meant it was a pretty soggy walk around. Although the view over Lisbon was worth the trip. On warm sunny evenings you can come up here and enjoy a glass of wine while learning more about the castle and taking in the stunning vista. "Finding The Right Glasses For You"
"Guide To Anti-Aging with Caudalie"
This is a great little guide Laura! The view from the castle looks beaut even on an overcast day!